Church suits may be the most elegant outfit that you put on each week. When you are stepping out to join your congregation, you want to do so in style. Not only are people in the church to worship, but it’s also a bit of social activity, and it's been that way for decades. It may be the only chance you have to see some of your best friends and close family. When you’re there, you want to put up a good image of who you are with quality women’s church suits. Find out how to pick out and purchase the best ones for you following these tips. You don’t want to wear women’s suits that are too large or too small. Along with them looking unflattering on you, it can also be extremely uncomfortable. You are going to be wearing this attire for the stretch of the service not to mention before and after. You don’t want to be in something that you can sit, stand, and move around in. Ideally, you should have your church suits custom fitted. It is the only way to get the most beautiful look and the most relaxed feel. Plus size women’s church suits are available for those that require other sizes. Suit pieces can be purchased together as a set or in separate jacket and bottom parts. Separates, in general, are a better option because you can get closer to your custom size and you only have to buy what you need. For instance, you can buy one jacket that pairs nicely with both a skirt and a pair of pants. Essentially, you have made two separate outfits with just three pieces. When you buy separates, be sure to clean them together so that they maintain the same wear. Women’s church suits can be found in a broad array of prices. Depending on what you want to spend, you can get something from a well-known designer with an expensive price tag or one that is lesser known with a lower price tag. There are also mid-level women’s church suits if you want to stay in the $99 to $299 range. It all depends on your budget and what you are willing to spend. Remember that quality is often reflected in the price of your purchase. Also, keep in mind that your church suits are something that you are likely to have around for many years to come. It’s an investment that, for most women, is worth making. 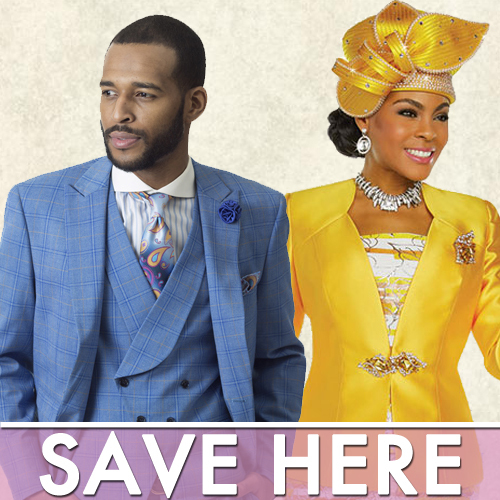 Traditionally, church suits are outfitted with skirts on the bottom and jackets up top with a nice blouse underneath. It’s suggested that you stick to that to achieve your Sunday best. Never get a skirt that is too short or one that has slits in the side. It’s not conservative enough for the occasion. When trying on skirts, sit down after you have it on to see how it looks and feels in that position.